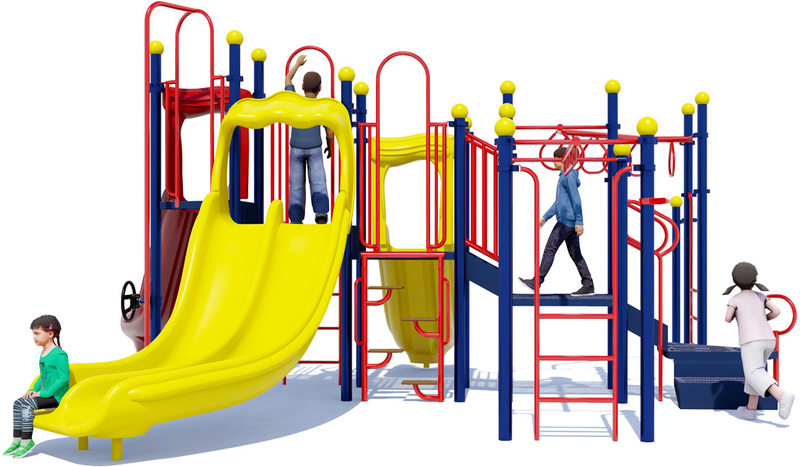 Kids enjoy any opportunity to monkey around on the playground, and the Monkey Maze commercial play structure provides a number of fun activities for up to 45 children ages 5 to 12 years old to be able to do just that. Children love to test their skills on the 90 Horizontal Loop Ladder to see if they can support their body using only upper arm strength. 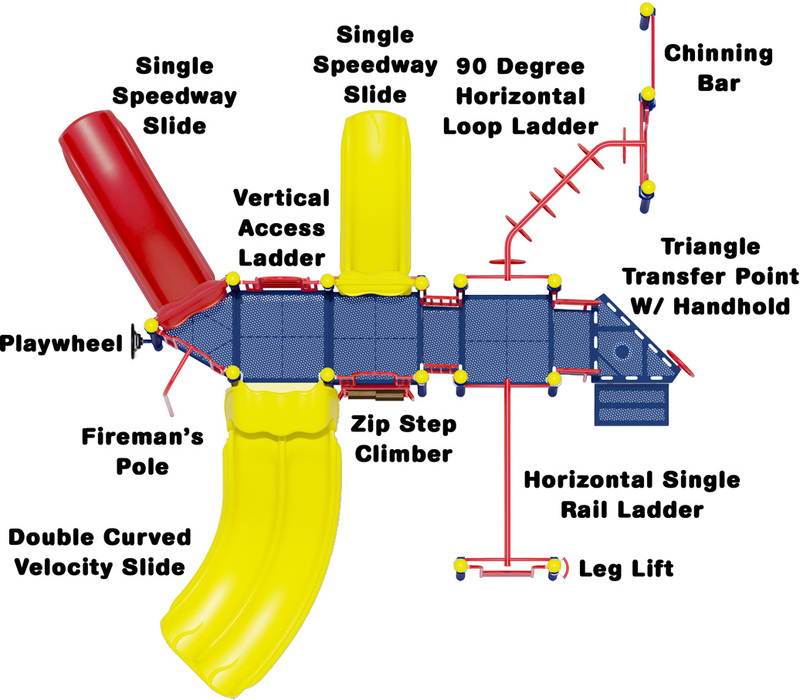 The structure offers three fun slide options when they get to the top, including a 5'4" tall Single Speedway Slide and a 4' tall Single Speedway Slide. Additionally, children can race each other on the 4'8" tall Double Speedway Slide. A 5'4" high Single Speedway Slide for a swift trip to the bottom. A 4'8" Double Speedway Slide lets children race each other side-by-side. A 4' high Single Speedway Slide for even more classic fun. A Chinning Bar for building upper arm strength. A 90° Horizontal Loop Ladder overhead climber. Horizontal Single Rail Ladder really improves upper body muscles. A Leg Lift allows kids to work out core muscles. A Zip Step Climber provides an opportunity to improve fitness. A Vertical Access Ladder for scaling the upper deck. A Firemans Pole for an exhilarating way to the ground. The structure is constructed from lead-free polyethylene coated punched steel decks, 3.5"O.D. galvanized 12 gauge aluminum posts, UV stabilized rotationally molded plastic components, and high-density polyethylene activity panels. Aluminum posts are powder-coated to customer color specifications, and are backed by a Lifetime Limited Warranty. All plastic components and decks come with a 15 year limited warranty. The metal pipes, rungs, loops, and rails associated with climbers come backed by a 50 year limited warranty. Call American Parks Company at 1-800-381-4491 and get assistance from one of our qualified playground experts. 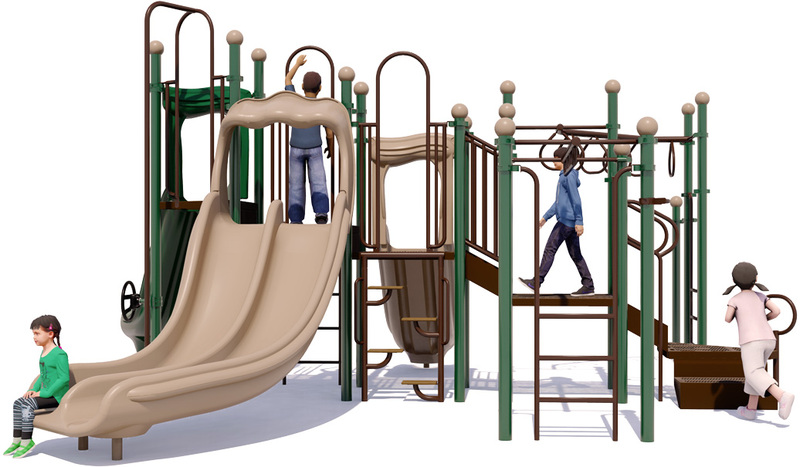 Learn more about our convenient playground bundle options, including surfacing, free freight and turn-key installation and much more. 1 Double Slide, 2 Single Slides, 1 Chinning Bar, And More!